LAS VEGAS — Welcome to the age of supercomputing for everyone. 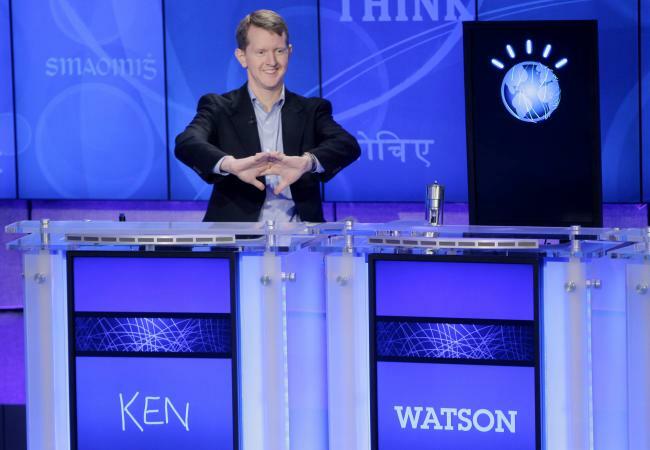 On Thursday IBM will announce that Watson, the computing system that beat all the humans on “Jeopardy!” two years ago, will be available in a form more than twice as powerful via the Internet. Companies, academics and individual software developers will be able to use it at a small fraction of the previous cost, drawing on IBM’s specialists in fields like computational linguistics to build machines that can interpret complex data and better interact with humans. IBM’s move to make its marquee technology more widely available is the latest effort among big technology companies to make the world’s most powerful computers as accessible as the Angry Birds video game. It is also an indication of how quickly the technology industry is changing, from complex systems that cost millions to install to pay-as-you-go deals that provide small companies and even individuals access to technology that just a few years ago only the largest companies could afford. “The next generation will look back and see 2013 as a year of monumental change,” said Stephen Gold, vice president of the Watson project at IBM. IBM is wielding Watson in a fight to control the world of cloud computing — huge collections of computer servers connected over the Internet — with other big technology companies like Amazon.com, Google and Microsoft. It is no coincidence that IBM discussed its Watson news the same week Amazon was hosting clients at a conference here to pitch its own computing cloud, called Amazon Web Services or A.W.S. The competition is still young, but its impact will be significant. Watson, a project on which IBM spent 14 years, is an artificial learning system that digests large volumes of information to find hidden meanings. Initial uses — besides besting humans on game shows — include examining medical patients and records to find an unexpected diagnosis, a bit like the genius portrayed in the television show “House.” Other uses include an online personal shopper and a virtual health aide that tailors exercises by asking questions. IBM is opening Watson to more people in part to see what additional businesses might be created. Watson is prominent, but similar projects are being run by other companies. On Tuesday, a company appearing at the Amazon conference said it had run in 18 hours a project on Amazon’s cloud of computer servers that would have taken 264 years on a single server. The project, related to finding better materials for solar panels, cost $33,000, compared with an estimated $68 million to build and run a similar computer just a few years ago. Akin more to conventional supercomputing than Watson’s question-and-answer cognitive computing, the project was the first of several announced at the Amazon conference. While revenues of Amazon’s cloud business are still small enough that the company does not have to disclose them, Amazon officials say Jeff Bezos, the company’s chief executive, believes A.W.S. could eventually dwarf Amazon’s businesses in books and merchandise, enterprises with $51 billion in revenue. This year, Gartner calculated that A.W.S. had five times the computing power of 14 other cloud computing companies, including IBM, combined. Since then, IBM has spent an estimated $2 billion to acquire a cloud company called SoftLayer and has reconfigured Watson as a cloud product. It also hired buses that drove around the A.W.S. conference in Las Vegas, sporting ads that said they showed its superiority in cloud computing. Besides gaining bragging rights and a much bigger customer base, IBM may be accelerating the growth of Watson’s power by putting it in the cloud. Mr. Gold said that Watson would retain learning from each customer interaction, gaining the ability to do things like interacting in different languages or identifying human preferences. IBM has taken steps to keep these improvements for its own benefit, by retaining rights in user agreements that customers are required to sign. It is likely that the competition among advanced computing systems will increase, lowering prices and delivering more capabilities to whatever use companies make of them. This year, Google and a corporation associated with NASA acquired for study an experimental computer that appears to make use of quantum properties to deliver results sometimes 3,600 times faster than traditional supercomputers. The maker of the quantum computer, D-Wave Systems of Burnaby, British Columbia, counts Mr. Bezos as an investor. 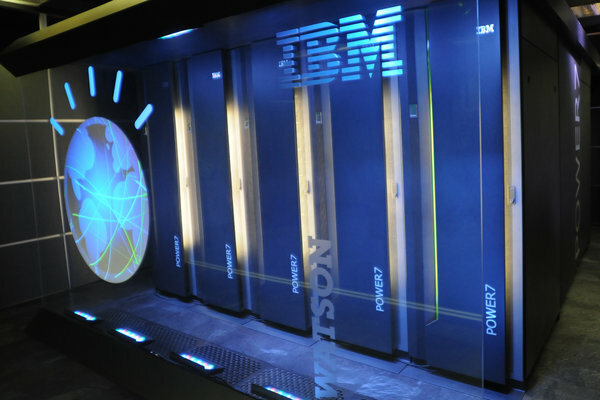 A version of this article appears in print on November 14, 2013, on page B1 of the New York edition with the headline: IBM to Announce More Powerful Watson via the Internet. The United States spent 17.9% of the GDP on healthcare in 2012. Academic medicine, which makes up, approximately, 20% of these costs ($540 billion), is under profound threat. Teaching hospitals and medical schools are faced with declining clinical revenue, dwindling research dollars and increasing tuition costs. To meet these challenges, we believe academic medicine must embrace disruptive innovation in its core missions: educating the next generation of health professionals, offering comprehensive cutting-edge patient care, and leading biomedical and clinical research. Medical schools and academic health centers will need to significantly adapt in each of these areas in order to ensure the long-term health of the medical profession. The following are a few examples of disruptive innovations Tulane School of Medicine has embraced. Medical information doubles roughly every five years, making it impossible for physicians to stay current. Computing power has also increased to the point that machines like IBM’s Watson, first programed to play chess and Jeopardy, are now used to diagnose and recommend treatment for patients. Mary Cummings, one of the first women aviators to land a plane on an aircraft carrier, faced a similar situation when she left the navy; a computer was replacing many of the skills she had acquired in order to fly. Today, as the Director of the Human and Automation Lab at MIT, she poses an important and related question: “Are we in Medicine teaching the next generation of physicians skills or are we teaching them expertise?” If we are teaching the former, then academic medicine faces obsolescence. However, if we emphasize the latter, our mission is durable. Skills equip people to respond to specific well-understood circumstances; expertise provides the capability to respond to highly complex, dynamic and uncertain environments. At Tulane University School of Medicine, we believe that the focus of medical education should be on how we teach; because what we teach will be largely out of date by the time students finish their training. The expertise required for the next generation of physicians is to be lifelong learners, team players, educators and problem solvers. We teach expertise through an “inverted” learning model. Students are expected to have reviewed the subject material before class. During class-time the students work in small groups to solve problems and explain to their colleagues issues they did not understand. Master teachers are still needed to facilitate students’ synthesis of material in a collaborative discussion-oriented environment, but this structure has the advantage of allowing investment in the areas where hands-on teaching adds value while providing cost savings in the areas where it does not. The organization that is likely to play a major role in providing on-line medical education is the Kahn Academy under Dr. Rishi Desai. A newly established three and a half year program for medical students with PhDs in the biomedical sciences leverages these adult learning principles. This program shortens the time to get a degree and so reduces the cost of tuition. Business models for patient care, a key source of revenue for medical schools, are also undergoing enormous change. Driven by the need to lower costs, and aided by new technologies, patient care is moving from the hospital to the outpatient setting and ultimately to wherever the patient happens to be located. For example, when the ACA (Affordable Care Act) is fully implemented in 2014 with a substantial increase in Medicaid recipients, the need for more primary care, as experienced in Massachusetts, will overwhelm the available capacity to provide such care. One solution to this problem is moving the majority of primary and secondary healthcare delivery into the community. After Hurricane Katrina, Tulane partnered with a network of Federally Qualified Health Centers in order to provide services to low and middle-income patients in community-based clinics designated as medical homes. These not only provide less expensive care, but also provide the kind of experiential learning necessary to teach expertise to trainees. Expansion into telemedicine, which has been shown to reduce the cost of Medicaid in California and has had a dramatic impact in the United Kingdom on patients with diabetes, heart failure, and chronic obstructive pulmonary disease, will further reduce costs while improving the quality of care. Yet another driver of disruption in academic medicine is the changing nature of how research is performed. It has been estimated that for every research grant dollar received by an academic health center, the institution must spend an additional 25 to 40 cents to support that research. Given declining clinical revenues and the relative flattening of the NIH budget, the ability to garner research funding is increasingly competitive and difficult to sustain. For most medical schools, this makes traditional research models inefficient and some institutions that have traditionally been primarily research focused will have to change their emphases. An additional disruptive technology in research is using “big data,” large data sets that can be analyzed in distributed and cloud computing environments. In 2011, the 3-dimensional structure of a retrovirus protease was finally determined after eluding scientists for over a decade. The configuration was not discovered by a computer, by a single scientist or even by a group of scientists working in a laboratory. Rather, the structure was determined by a group of gamers working in the cloud with a program called Foldit that was developed by computer scientists at the University of Washington in only three weeks. The ability to collaborate without physical interaction using a variety of skill sets challenges the definition and funding models of research (not to mention who gets credit), but has vastly superior economies of scale. Disruptive technologies threaten every mission of the academic health center. Examples from business have taught us that companies that survive disruption do so by being agile, experimental, problem driven and solution agnostic. 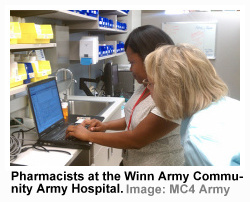 Only through embracing coming and inevitable changes head-on rather than remaining entrenched in traditional structures, culture and processes, can academic health centers maintain their pre-eminence and viability. Building on inherent strengths while morphing to embrace change, disruptors can help ensure relevance and maintain competitive advantages. 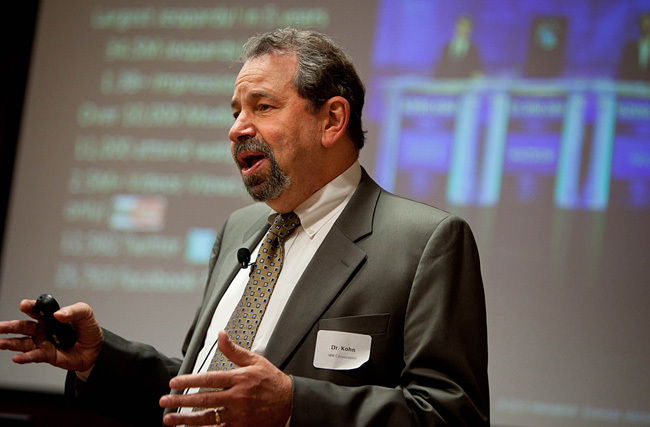 Ralph Maurer, PhD, is the Executive Director of the Levy-Rosenblum Institute, Freeman School of Business, Tulane University. Steven A. Wartman, MD, PhD, MACP is President and CEO of the Association of Academic Health Centers, Washington, DC.